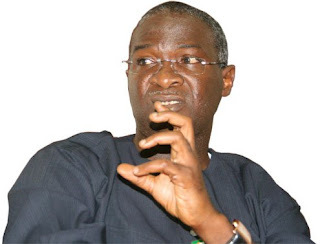 Fashola had come under fire after the Lagos State Public Procurement Agency posted a report on its website, stating that N78.3m was paid to a firm, Info Access Plus Limited, for the upgrade of his website, www.tundefashola.com, through the Office of the Chief of Staff to the Governor. The ex-governor had last week defended the decision by his government to spend N78.3m on the upgrade of the website in a five-page letter he personally signed, in which he admitted that the money was actually spent on his website. Fashola also berated CACOL, in his letter titled ‘When you wrestle with a pig, the pig gets happy and you get dirty,’ for dragging him to the Economic and Financial Crimes Commission and for calling on President Buhari not to give him a political appointment. Fashola said, “I cannot conclude without responding to the crusade of CACOL and their ilk seeking my prosecution on allegations that have no proof and writing pre-emptive letters to the Presidency. However, the Executive Chairmain of CACOL, in a statement titled, ‘We Don’t Mind Wrestling With The Pig As Long As It Produces The Pork,’ on Saturday, said if the former governor could justify the cost of his personal website, no matter what he used it for, then there might be many more shenanigans to be unearthed by the relevant anti-graft agencies. He said, “The Oxford Advanced Learner’s Dictionary defines a “pig” as an unpleasant or offensive person; a person who is dirty or greedy. Based on this premise, leaders who deliberately run elitist, oppressive and draconian government can only be described by no other name, but pigs. “A government that causes so much hardship to the largest stratum of the socio-economic ladder, whereas it engages in obscene affluence all in the name of white elephant projects that have no direct bearing on the suffering Lagosians, is nothing but a pig. Adeniran asked of what use was a N78.3m-website when several other developmental needs of people in Lagos were begging for attention. Adenira further said, “Basically, what concerns us more is the issue of suspected corruption embedded in the award and execution of contracts in the regime of Babatunde Fashola, as illuminated by the award of this N78.3m website contract. “Every IT person CACOL has contacted put an over-bloated estimate of the cost of the website at about N6m. We are not surprised that a contract that could have cost N6m could be ballooned to N78.3m, because that is a trademark of Mr. Fashola’s administration.